Home Arts Make some noise: Join a music ensemble! Make some noise: Join a music ensemble! Ever wanted to make music with a group of people, but not sure where you can find said group? Why not join one of the several music ensembles we have here at the University of Waterloo? You can join choirs, a chamber ensemble, a jazz ensemble, an orchestra, and even a Gamelan group! Also, a bonus: Each ensemble listed here can even be taken for credit (0.25 units each)! All of these groups rehearse in the Conrad Grebel Building (unless specified otherwise in their individual descriptions below). The Chamber Choir meets every Tuesday and Thursday in the CGUC Chapel from 4:00 to 5:30 pm beginning the first week of classes, and is led by Mark Vuorinen. This small ensemble of about 25 voices performs several times per term. Acceptance is by audition, and at the discretion of the director. The Chapel Choir, under the direction of Katherine Steiner, meets every Monday and Wednesday from 4:00 to 5:45 pm in the Conrad Grebel Chapel beginning the first week of classes. This choir is a group of about 20 singers who participate in college chapel services (Wednesday, 4:30 to 5:30 pm) and occasionally visits local congregations. Acceptance into Chapel Choir is by audition, and at the discretion of the director. Monday, January 7 from 4:00 pm to 5:30 pm. Wednesday, January 9 from 3 to 3:50pm. There is an open rehearsal at 4pm that same day. Friday, January 11 from 2:00 to 3:50pm. The University Choir meets every Tuesday in the Conrad Grebel University College (CGUC) Chapel from 7:00 to 10:00 pm beginning the first week of classes each term. This large choir of approximately 90 singers performs a variety of works from the past and present. A brief vocal interview is required to join the group. Acceptance into the University Choir is by interview and at the discretion of the director, Liska Jetchick. Tuesday, January 8, 6:00pm till 10:00pm. Thursday, January 10, 9:30am to noon. Thursday evening, 6 to 10pm, Chapel. Vocal Techniques meets on Wednesday evenings from 7:00 to 9:00 pm in room 1302. It is structured in a lab format, led by Stephanie Kramer. It covers the foundations of singing, basic pedagogy, diction/phonetics, practice routines, and performance tips designed to prepare students for more in-depth individual voice instruction. There will be opportunity to sing a variety of repertoire during class time, using the skills covered. This course is also useful for pianists interested in vocal accompanying. The ensemble size is limited to 20 with priority given to students enrolled in a music studio course. Acceptance into Vocal Techniques is by an audition interview, and at the discretion of the instructor. This ensemble may only be taken once, and there is no prior knowledge required to join this group. As this is a group that is only active during the Fall Term, please check the https://uwaterloo.ca/music/ensembles for further information on future opportunities. The Instrumental Chamber Ensembles meet at different times during the week, depending on the schedule of the members of each ensemble. The ensemble performs a wide variety of classical music from all time periods. Instrumentalists will be placed in small groups of approximately 3 – 8 players, based on compatible abilities. Acceptance into the Instrumental Chamber Ensembles is by audition and at the discretion of the director, Ben Bolt-Martin. Thursday, January 10 from 9:30 am to noon. The Jazz Ensemble meets on Monday nights from 7:00 to 10:00 pm in Room 1111. The director tries to accommodate both traditional and non-traditional jazz instruments in the ensemble. Acceptance into the Jazz Ensemble is by audition and at the discretion of the director, Michael Wood. Winter 2019 audition dates: Monday, January 14, 6 to 10pm. 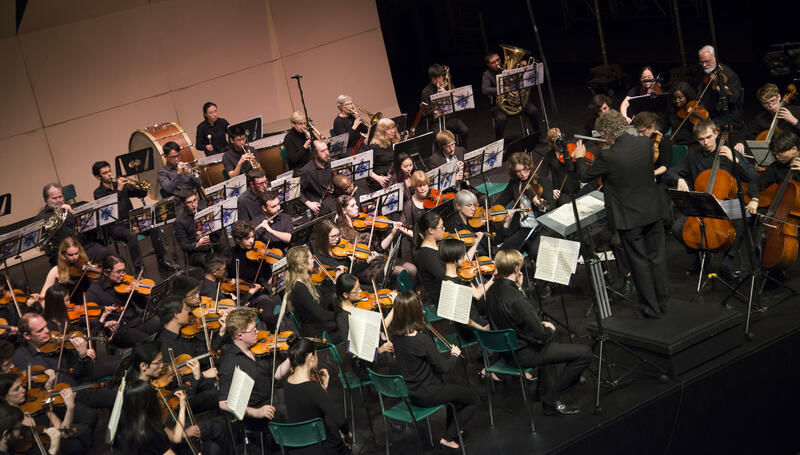 Orchestra@uwaterloo is a university-wide orchestra open to students, staff, faculty, and alumni of the University of Waterloo. The orchestra’s Music Director is Daniel Warren. Orchestra@uwaterloo is re-formed each term based on auditions. Undergraduate students form the majority of the orchestra’s 60–70 musicians, though faculty, staff, graduate students, and alumni also participate. Members represent an academic cross-section of the university. The orchestra rehearses at Ron Eydt Village on Thursday nights, from 7 to 9:30 pm during the Fall and Winter terms. In Spring Term the orchestra will rehearse at Conrad Grebel University College. Thursday, January 17: after open rehearsal in Great Hall at Ron Eydt Village at 7pm. Since Fall 2013 the Department of Music has expanded its Music Ensemble offerings to include a World Music Ensemble: Balinese Gamelan (semara dana) from the island of Bali, Indonesia. In 2016–17, with Artist-in-Residence, I Dewa Made Suparta, we are excited to offer a second World Music Ensemble—the UW Balinese Chamber Gamelan(gender wayang). Both being an aural/oral tradition, repertoire—from ritual pieces to modern compositions, instrumental or dance—is learned and played without the use of sheet music. Students experience a communal process of creating a unified sound on the Balinese gamelan ensemble of their choice. No previous experience with gamelan or notation is necessary. How to join (Winter 2019): All new and interested students need to attend the information session/open rehearsal on Tuesday, January 8th at either 2:00pm or 3:00pm in Conrad Grebel, room 1209. Note that no prior Gamelan experience is necessary. If this date does not work for you, come on Thursday, January 10 at 3pm. This gives the director an opportunity to provide you with the context for Balinese music, and address any questions you may have about joining the ensemble. For further details on any of these groups, check out https://uwaterloo.ca/music/ensembles.